The dsp.FarrowRateConverter System object™ implements a polynomial-fit sample rate conversion filter using a Farrow structure. You can use this object to convert the sample rate of a signal up or down by an arbitrary factor. This object supports fixed-point operations. Create the dsp.FarrowRateConverter object and set its properties. frc = dsp.FarrowRateConverter creates a polynomial filter-based sample rate converter System object, frc. 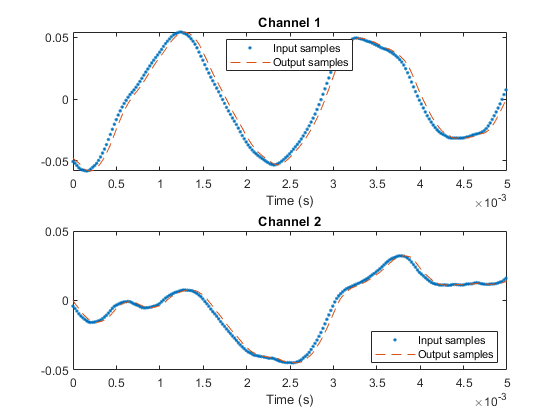 For each channel of an input signal, frc converts the input sample rate to the output sample rate. frc = dsp.FarrowRateConverter(Name,Value) sets properties using one or more name-value pairs. Enclose each property name in single quotes. Example: frc = dsp.FarrowRateConverter('Specification','Coefficients','Coefficients',[1 2; 3 4]) returns a filter that converts from 44.1 kHz to 48 kHz using custom coefficients that implement a 2nd-order polynomial filter. frc = dsp.FarrowRateConverter(fsIn,fsOut,tol,np) returns a sample rate converter System object, frc, with InputSampleRate property set to fsIn, OutputSampleRate property set to fsOut, OutputRateTolerance property set to tol, and PolynomialOrder property set to np. Sample rate of the input signal, specified as a positive scalar in Hz. The input sample rate must be greater than the bandwidth of interest. Sample rate of the output signal, specified as a positive scalar in Hz. The output sample rate can represent an upsample or downsample of the input signal. Maximum tolerance for the output sample rate, specified as a positive scalar from 0 through 0.5, inclusive. The actual output sample rate varies but is within the specified range. For example, if OutputRateTolerance is specified as 0.01, then the actual output sample rate is in the range OutputSampleRate ± 1%. This flexibility often enables a simpler filter design. 'Polynomial order' — Use the PolynomialOrder property to specify the order of the Lagrange-interpolation-filter polynomial. The object calculates coefficients that meet the rate and tolerance properties. 'Coefficients' — Use the Coefficients property to specify the polynomial coefficients directly. Order of the Lagrange-interpolation-filter polynomial, specified as a positive integer less than or equal to 4. The object calculates coefficients that meet the rate and tolerance properties. This property applies only when you set Specification to 'Polynomial order'. Filter polynomial coefficients, specified as a real-valued M-by-M matrix, where M is the polynomial order. 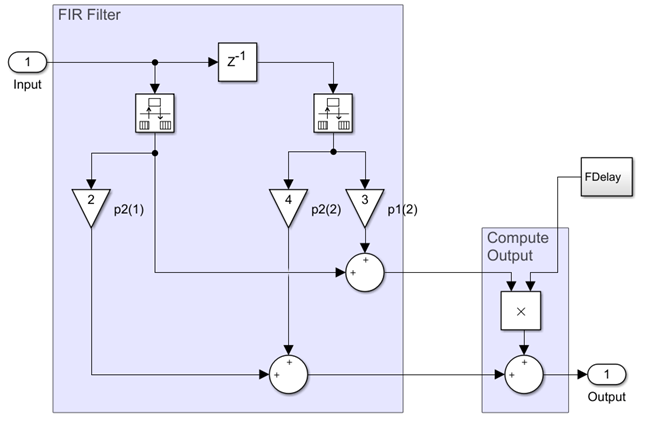 The diagram shows the signal flow graph for a dsp.FarrowRateConverter object with coefficients set to [1 2; 3 4]. Each branch of the FIR filter corresponds to a row of the coefficient matrix. This property applies only when you set Specification to 'Coefficients'. Rounding method for fixed-point operations, specified as a character vector. For more information on the rounding methods see Rounding Modes. Overflow action for fixed-point operations, specified as either 'Wrap' or 'Saturate'. For more details on the overflow actions, see Overflow Handling. Data type of the filter coefficients, specified as a signed numerictype object. The default data type is a signed, 16-bit numerictype object. You must specify a numerictype object without specific binary-point scaling. To maximize precision, the object determines the fraction length of this data type based on the coefficient values. Data type of the fractional delay, specified as an unsigned numerictype object. The default data type is an unsigned, 8-bit numerictype object. You must specify a numerictype object without specific binary-point scaling. To maximize precision, the object determines the fraction length of this data type based on the fractional delay values. Data type of the multiplicand, specified as a signed numerictype object. The default data type is a signed 16-bit numerictype object with 13-bit fraction length. You must specify a numerictype object that has a specific binary point scaling. 'Same word length as input' — Output word length and fraction length are the same as the input. 'Same as accumulator' — Output word length and fraction length are the same as the accumulator. numerictype object — Signed fixed-point output data type. If you do not specify a fraction length, the object computes the fraction length based on the input range. The object preserves the dynamic range of the input. y = frc(x) resamples input x to create output y according to the rate conversion defined by frc. Input signal, specified as a vector or matrix. The row length of x must be a multiple of the overall decimation factor. Each column of x is treated as a separate channel. Resampled signal, returned as a vector or matrix. Note: The dsp.AudioFileReader and dsp.AudioFileWriter System objects are not supported in MATLAB Online. Create a dsp.FarrowRateConverter System object™ to convert an audio signal from 44.1 kHz to 96 kHz. Set the polynomial order for the filter. Check the resulting interpolation and decimation factors. Display the polynomial that the object uses to fit the input samples. Convert 100 frames of the audio signal. Write the result to a file. Release the AudioFileWriter System object™ to complete creation of the output file. Plot the input and output signals of the 100th frame of data. Delay the input to compensate for the latency of the filter. Zoom in to see the difference in sample rates. Create a dsp.FarrowRateConverter System object™ with 0% tolerance. The output rate is equal to the OutputSampleRate property. The input size must be a multiple of the decimation factor, M. In this case M is 320. Allow a 1% tolerance on the output rate and observe the difference in decimation factor. The decimation factor is now only 13. The lower the decimation factor, the more flexibility in input size. The output rate is within the range OutputSampleRate ± 1%. Create a dsp.FarrowRateConverter System object™ with default properties. Compute and display the frequency response. Create a dsp.FarrowRateConverter System object™ with default values. Determine its computational cost: the number of coefficients, number of states, multiplications per input sample, and additions per input sample. Repeat the computation, allowing for a 10% tolerance in the output sample rate. Farrow filters implement piecewise polynomial interpolation using Horner’s rule to compute samples from the polynomial. The polynomial coefficients used to fit the input samples correspond to the Lagrange interpolation coefficients. Once a polynomial is fitted to the input data, the value of the polynomial can be calculated at any point. Therefore, a polynomial filter enables interpolation at arbitrary locations between input samples. You can use a polynomial of any order to fit to the existing samples. However, since large-order polynomials frequently oscillate, polynomials of order 1, 2, 3, or 4 are used in practice. The block computes interpolated values at the desired locations by varying only the fractional delay, µ. This value is the interval between the previous input sample and the current output sample. All filter coefficients remain constant. The input samples are filtered using M + 1 FIR filters, where M is the polynomial order. The outputs of these filters are multiplied by the fractional delay, µ. The output is the sum of the multiplication results. The diagram shows the data types that the dsp.FarrowRateConverter object uses for fixed-point signals and floating-point signals. You can specify these data types using the properties of the object, see Fixed-Point Properties. If the input is floating point, all data types in filter are the same as the input data type, single or double. If the input is fixed point, the FIR filter defines internal data types using the RoundingMode, OverflowMode, and CoefficientsDataType properties. The accumulators and products within the FIR filter use full precision data types. The object casts the output of the FIR filter to MultiplicandDataType. Hentschel, T., and G. Fettweis. 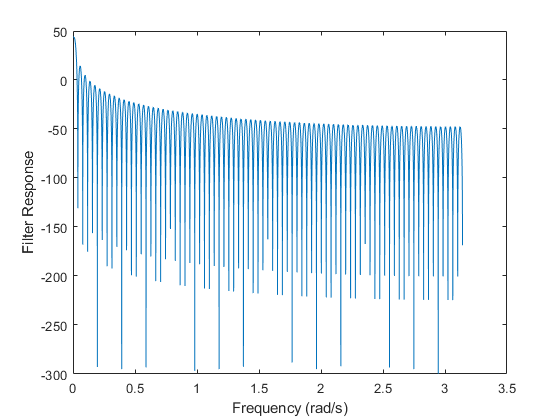 "Continuous-Time Digital Filters for Sample-Rate Conversion in Reconfigurable Radio Terminals." Frequenz. Vol. 55, Number 5-6, 2001, pp. 185–188. The getRateChangeFactors function supports C and C++ code generation.